This tastes best on the day it is made, but you can make the pastry in advance and freeze or chill overnight. Make the pastry: sift the flour and salt on to a clean surface. Make a well in the centre and add the other pastry ingredients. Using your fingertips, lightly jab the butter, sugar and yolks until they are worked together. Using a palette knife, flip and cut the flour into this mixture until it forms chunks of soft dough. Cool your hands under the cold tap before lightly kneading the mix into a smooth dough. Wrap in a polythene bag and chill for an hour. Preheat the oven to 190C, gas mark 5. Roll out the pastry, then gently lift into a 23cm tart ring. Gently press it into the ring. Prick the base and line with greaseproof paper. Fill with baking beans or rice and chill for 30 minutes. Bake the pastry blind for about 7 minutes, then remove the paper and beans and bake for a further 2-3 minutes, until it loses its raw look. Meanwhile, put the sugar and vanilla pod in a wide saucepan with 115ml water. Set over a low heat, stirring occasionally, until the sugar has dissolved. Halve the apricots and, using a hammer, crack open their stones. Extract the almond-like kernels and add to the syrup, to give it a lovely almondy flavour. Add a single layer of apricot halves to the hot syrup, turning them so that they are coated on both sides, but leaving them cut side down in the syrup. Cook very gently for barely 2 minutes until they are just cooked but still retain their shape. Remove with a slotted spoon and arrange on a large plate. Repeat the process with the remaining apricot halves. Once all are cooked, tip any excess juice from the apricot plate into the saucepan and bring the mixture up to the boil. Cook vigorously until it forms a thick syrup, but make sure that it does not caramelise. Strain into a clean container. 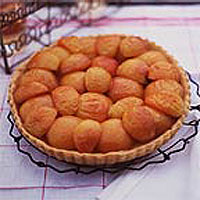 Arrange the apricot halves, cut side down, in the pastry case and spoon over some of the thickened syrup to act as a glaze, coating the apricots. Return to the oven and bake for 8 minutes. Remove and serve once cold. This recipe was first published in May 2002.